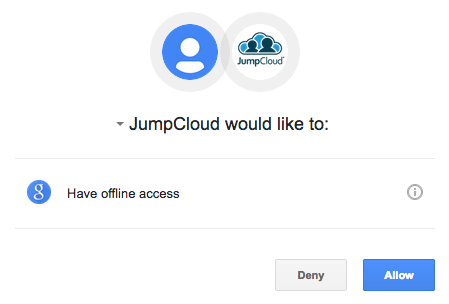 Secure, persistent connectivity between JumpCloud and G Suite. Import of pre-existing Google Accounts into JumpCloud. Export (provisioning) of new accounts into G Suite. Continual synchronization from JumpCloud to Google Accounts. G Suite for Non Profit and G Suite Free Edition aren't supported. This is a Google restriction. Google only provides their User Access API to paid license levels. OAuth connection and integration is only allowed with one Google domain. G Suite Synchronization is NOT the same as SSO with G Suite. If a user is bound to G Suite during the user creation process and a password is set, the user is created in G Suite, however their password needs to be set a second time for it to synchronize with G Suite. In the Google Admin console, go to Security > API Reference, then select Enable API access. In the JumpCloud Admin portal, go to Directories > G Suite, then select Authorize G Suite Sync. Access must be granted by a Google Super Admin account. If necessary, log in as a Super Admin and click Allow to authorize the sync. After you authorize the sync, the user import list will automatically launch in a new tab. You can close this tab closed without importing users. Note: When users are imported from G Suite, JumpCloud populates the Username field with the username portion of the imported user's email address as it is configured in G Suite. Select one or more uses to import. The Import Complete dialog will display with the results of the import. If you close this dialog, you will also close the import list and return to the JumpCloud admin portal. After the import, go to Users. All imported users will be inactive pending completion of the registration process. To complete registration, the password for the account must be set, either by the user or the admin. How does attribute data flow between G Suite and JumpCloud after integration? When you bind that user to G Suite in JumpCloud - attributes in G Suite are automatically overwritten with data from JumpCloud. Further, any subsequent changes made to the user’s attributes in JumpCloud are automatically pushed to the corresponding attributes in G Suite. With the exception of several attributes that are selected by default, you can choose the user attributes you would like to export to G Suite. Selected attributes are automatically synced with G Suite. This means that after you export an attribute to G Suite, data for that attribute is sent from JumpCloud to G Suite. Likewise, if you choose to stop exporting data for an attribute, it is no longer synced with G Suite. Subsequent changes made to that attribute in JumpCloud are not exported to G Suite. Important: Take caution when selecting attributes to export. After you select an attribute to export to G Suite it is immediately overwritten with data from JumpCloud and you could potentially lose data stored for that attribute in G Suite. See Attribute Data to learn about how attribute data is exported to G Suite. The following table outlines how attribute data is exported from JumpCloud’s API to G Suite’s API. The attribute listed in the JumpCloud API Attribute Name column is exported to the attribute listed in the G Suite API Attribute Name column. Go here for related API information. Note about address attributes: Both the JumpCloud and G Suite APIs allow multiple addresses for a given type. On export, existing G Suite addresses for a given type are replaced with JumpCloud addresses of that type. addresses.formatted Addresses are exported as a single, formatted value that includes all of the address values listed in the JumpCloud API Attribute Name column. See Note about address attributes. The following table outlines how attribute data is exported from JumpCloud’s UI to G Suite’s UI. The attribute listed in the JumpCloud UI Attribute Name column is exported to the attribute listed in the G Suite UI Attribute Name column. Work Address Address (Work) Data exported for this attribute is viewable only in the G Suite API. This is a drop-down menu field. Work Fax - Data exported for this attribute is viewable only in the G Suite API. Work Cell - Data exported fo this attribute is viewable only in the G Suite API. Home Address Address (Home) Data exported fo this attribute is viewable only in the G Suite API. Home Phone Phone (Home) This is a drop-down menu field. Personal Cell Phone (Mobile) This is a drop-down menu field. The user will be sent an email requesting a password reset. If the user's existing password complies with JumpCloud password complexity requirements and password history is not enforced, they may opt to reuse their existing password for G Suite. IMPORTANT: Unbinding a user from the G Suite Directory will immediately place the G Suite user in the Suspended users group within G Suite. The user's existing sessions will be expired and they will be unable to login to any G Suite resources. Import G Suite Users: Launches the import wizard. This can be run as many times as needed. 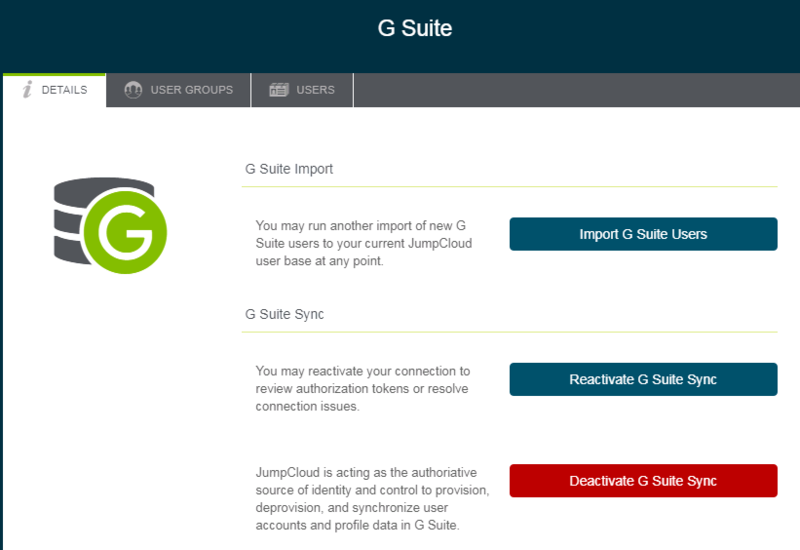 Reactivate G Suite Sync: This enables an administrator to refresh tokens of privileged user accounts who are maintaining the persisted connection between JumpCloud and the service through OAuth 2.0. This will also help to resolve connection issues and will not result in the ‘un-selection’ of any currently bound JumpCloud users. Deactivate Service Button: This will result break the synchronization with G Suite, then unbind all users and groups from G Suite. G Suite accounts will not be affected when performing this step. Do not use this unless you intend to no longer use the synchronization function. Taking over an existing G Suite account follows the previously outlined process for importing and binding users. Since users already have access to their Google email, the only consideration is user education that JumpCloud will manage their G Suite password going forward. JumpCloud doesn't currently allow for a secondary email address or a way to securely transport a temporary password, so this method is better if the user is on site and can be physically handed a temporary JumpCloud password, or is allowed to set the password in the admin console.